Easily available and quick to cook, methi or fenugreek leaves are a blessing to mankind. 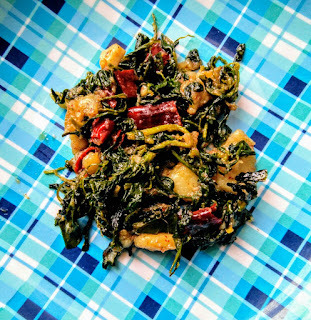 This vegetable has highest iron content as just 5 grams or a spoonful contains more than 1 milligram of iron. Here is a quick and simple recipe to include healthy Iron in our diet. 1 In a heavy bottom pan, heat the oil on a medium flame. 2 Add diced garlic cloves. 3 When it turns golden, add in the whole red chilies . 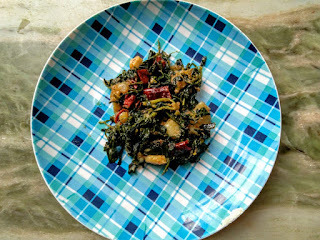 4 Quickly add the chopped potatoes, salt and methi leaves. Let cook on a med flame stirring occasionally. 6 Within 8 minutes, the delicious sabzi will be ready. 7 Note ; it should not be over cooked .